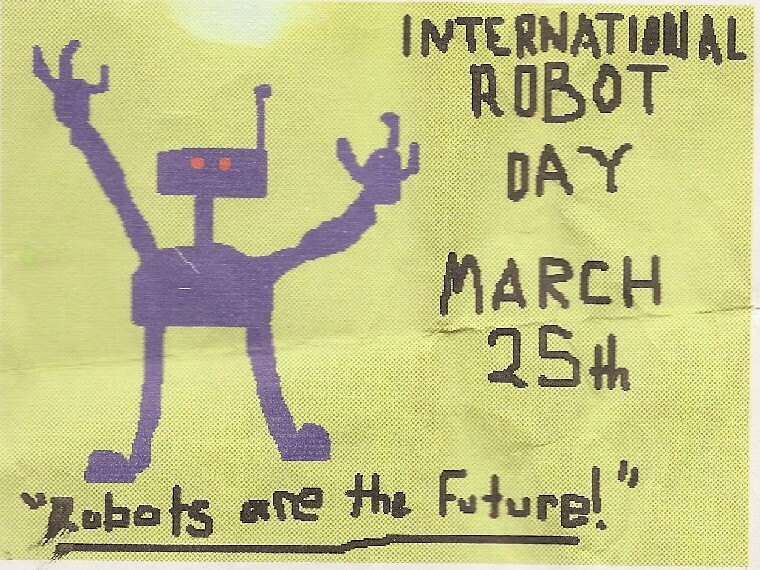 As I mentioned a few years ago, I once decided that March 25th is International Robot Day. Then I decided to stick with it. Nobody has the power to stop me! And this is March 25th! Happy International Day to everyone, but especially to robots. If not for this drawing, I would not at all even remember that I had chosen an International Robot Day. But when I started making an actual webcomic about robots, I looked at this drawing and decided to use that robot design as Stanislav Blue. PDR never leaves a character behind. Someday, I probably should get around to doing a story about Stanislav. Hmm. I went through my harddrive to find old remnants of a song I was working on that was never finished, I had planned on finalizing it for our own International Robot Day but I didn’t have the patience to do so. Instead I took an existing song and tinkered with it and added “lyrics” and I’m wondering if legally it has been altered enough to be considered a remix so I can upload it somewhere oh what the hell I’ll do it for you guys. Behold! Anonymous – Rainman (Nigerian Scam Remix). Details inside! Wow, so much research! Thanks Marq! Is it cool if I play the race card and claim that we negate the one in February since that is already Black History Month and we shouldn’t take away from it by making Robot holidays in there too? I mean, sure, that’s just my stupid way of trying to legitimize mine over the Feb. 5 International Robot Day, but I will take any excuse I can to do so. I’m assuming the February one is just for black robots.